I hate waiting. I’m bad at queues, being on hold, traffic that’s not moving, and anything else that feels like a waste of time. Being ready to go for a meeting with only a few of the meeting participants in the room is frustrating, and something I put effort into avoiding. The average company loses more than 20 per cent of its productive power to organisational drag — all the practices, procedures, and structures that waste time and limit output. 20 per cent, that's one fifth of the working week! Or another way to think about it is that one day a week is dedicated to all sorts of over communication, meetings that are unnecessary and complex bureaucratic processes that stifle peoples capacity to get stuff done. It's something that we often observe ourselves in delivery of projects. The symptoms of the 'drag' are everywhere; calendars that are back to back, meetings that lack purpose and focus (and go for too long), emails that pile up and the complexity of so many people involved in every decision. This article talks about organisational drag is like it's a chronic disease, it needs constant management, or it completely overtakes your organisation. Anything that takes constant management requires discipline and consistency, and taking back control of the meeting process is one small step we can take to reduce the 'drag.' 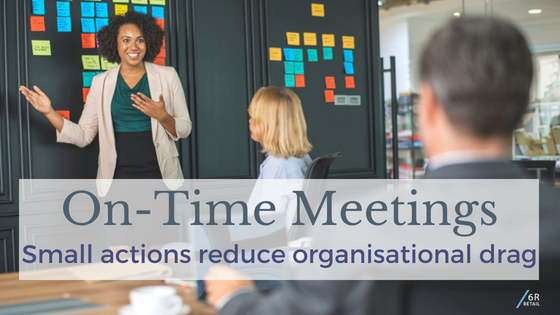 Meetings are seen often as a necessary evil, something that many people ‘love to hate’ they complain about them running over time or being disjointed, and off topic but then contribute to this problem by running late themselves and introducing items that are not relevant to the discussion. I read a lot of advice that emphasises the importance of forming good habits. Some good habits are considered ‘cornerstone behaviours’ and in life, cornerstones that are advocated for are: exercise, eating well, and getting enough sleep. If these are the cornerstone habits of making stuff work in life and health, then when it comes to organisations you can gauge a lot from behaviours like meeting culture and the state of common areas. Consider ‘meeting approach’ one of the cornerstone habits of an organisation. 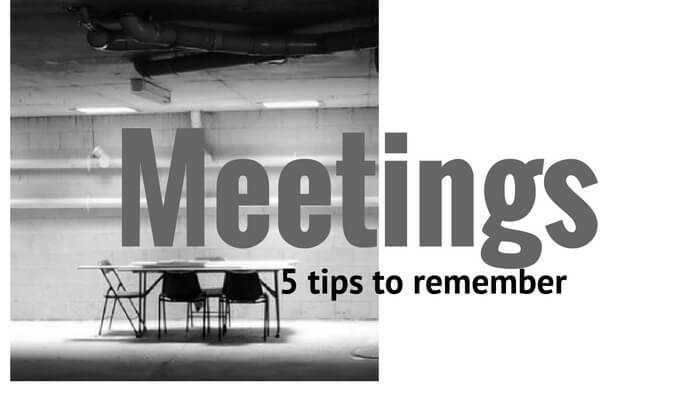 In projects, it’s important to establish good meeting habits early in the engagement with clients. I consider it one of the small things that we do that builds trust and consistency. Being on time and ready for meetings is something that contributes to the time we spend together being productive and useful for everyone. If I start on time and finish on time (or early) and participants come prepared with what they’re supposed to do and make themselves ready for the conversation, we get a lot done. To me, this is about creating a good working relationship. And if I stuff up, I own it and make every effort not to do that again. Small behaviours have a ripple effect. A project participant recently told me “I’ve have been more prompt generally since you’ve been here!” She was talking about more than work. She has taken me seriously on starting meetings on time and meeting deadlines and it has spread to other aspects of her / and life too. Small habits make a difference. Showing up on time and being prepared for the conversation is a good cornerstone habit to put effort into in your projects and business. What other good habits make a difference for you?